The Christian Wife Life: ice cream cone cupcakes. First of all, thank you for everyone who has commented/sent me messages/emailed me about yesterday's post! I definitely had no idea that it would get a response like that. It is so good to read different opinions and to have a lot of feedback to think about and to pray about. I truly mean that. I love the accountability factor of the blog and am so scared of it at the same time. I've never been an open, transparent person, so this is all new for me and God is teaching me sooo much! The main lesson being that I am literally nothing without Him. Nothing. He is everything. 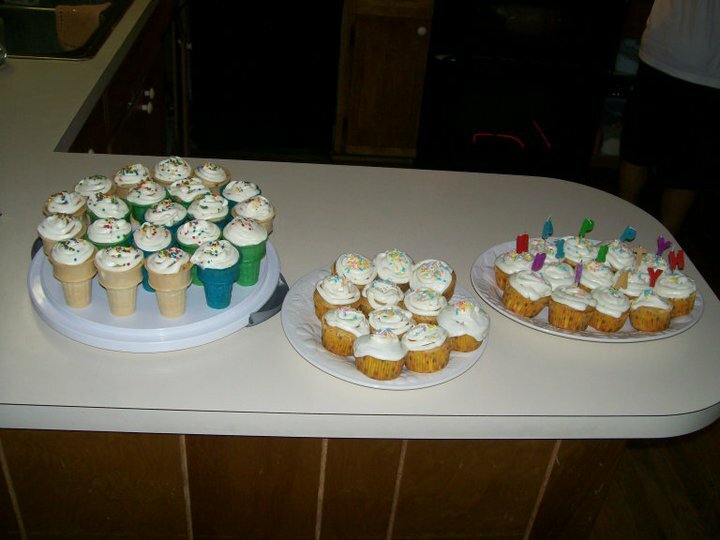 Not long ago I made cupcakes for my sister-in-law's birthday party, but I made them with a twist. Instead of being in their normal little cups, I baked them in ice cream cones. You may have heard of this before, but I hadn't until recently and knew I had to try it. When I practiced, all that the grocery store had at that point was colored cones, and we did chocolate instead of Funfetti that time but they still turned out cute. Yes, there is a cupcake underneath that icing. I first saw it on Pinterest, (if you don't know what Pinterest is, look it up, it's really cooool) and it led me to this blog post about making them. So I just followed what that post said to do it, so the credit belongs there, but I will tell you about it here. Seriously look at that blog post though because I do not have good pictures like she does! It's super hard. It will probably take me a long time to list the instructions, but I'll try. 1. You mix the cupcake mix with the other ingredients. 2. You pour it into the ice cream cones. 3. You bake them in the oven just like you would do for regular cupcakes. I mean, I don't know how I pulled all of that off. So complicated. I am such a pro baker. Yeaahhhh so anyway, there's not much else to tell you besides a few tips for making it even easier. You should probably make a pan like she tells you how to do in that blog post. Otherwise I don't know how I would have succeeded in not knocking them over. Just cut holes in an aluminum baking tin thing to put the cones in. You'll be good to go. Don't judge those too much. It was my first time and also a ten year old was helping me. Then you should be ever so careful when pouring it into the cones. Do not fill them too high...they will overflow very easily. Definitely leave some space below that line near the top of the cone. I put the batter into a ziplock bag and cut off a corner like she suggested, and that definitely helped. Same thing for the icing if you don't have a piping tool. Also, if you're going to do this for some sort of event, practice beforehand so you can get the hang of it. I did it with the kids I babysit before I did it for Anna's party and they loved them and how they turned out. So that was swell. By the way...it's awesome to be able to communicate with y'all through Facebook, so if you haven't already - definitely "like" The Christian Wife Life Facebook page! :) Thank you tons! Those are great! I have had Moms in my classes make them for their children's birthdays. FUN! I think I'm going to try this for when Hayd turns 2 in a few weeks!! Would be perfect for his playdate party!! i love the 5 lb weights laying on the counter behind the cupcakes :) a constant reminder of how much it stinks to work those delicious calories off! very cute idea, i'm going to have to try it. july and all the fun it offers. happy 4th of July. pray for our country.